The latest addition to the Novoflex TrioPod tripod collection, the new TrioPod PRO75 is a high-capacity model for the heaviest of professional photo and video setups. The basis for the new system is the tripod spider base plate, which is said to have a reinforced design to provide exceptional stability. This can be combined with whichever of the Novoflex legs range best suit the user’s needs, although the firm recommends the three- or four-section leg sets (the C3930 and C3940, respectively). These legs are made from eight-layered carbon fibre, which is what allows them to support such heavy loads. With the longest legs attached, the tripod can reach a maximum 2m height. The base plate features seven leg-locking positions, namely 23°, 45°, 65°, and 87° for flat surfaces, together with 155° for support against vertical surfaces and 43° for flipping the tripod upside down to use at ground level for macro work, and finally an 180° option that allows the legs to be stowed away for easy transportation. 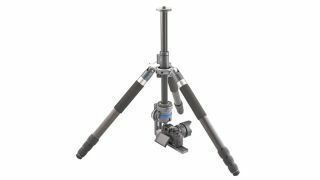 The tripod also has a self-locking geared centre column for extra stability, which can be adjusted by up to 48cm. The PRO75 can fit most 75mm accessories from other manufacturers, allowing users to build a highly customised rig to their tastes, while there’s also full compatibility with Novoflex’s TrioPod and QuadroPod systems. All that support doesn’t come cheap. The Novoflex PRO75 base plate is available on its own for $885.28 (around £634), and if you want it bundled with the three- or four-section legs, you’re looking at paying $1476.64 or $1550.56 respectively. In those kits, however, in addition to the base plate and legs, you also get two A1010 mini-legs, a tripod bag and a multi-tool. To find out more, head to the Novoflex website.